A private tomb thought to be more than 4,000 years old and built for a senior official from the 5th dynasty of pharaohs has been uncovered in a remarkably preserved condition in Egypt. Antiquities minister Khaled al-Anani announced the find in Saqqara, just west of Cairo, which is also home to the famed Step Pyramid. Brightly painted relief statues were part of the “exceptionally well-preserved” treasures found in the tomb of a priest called Wahtye who was involved in royal purification during the reign of King Nefer Ir-Ka-Re about 4,400 years ago. 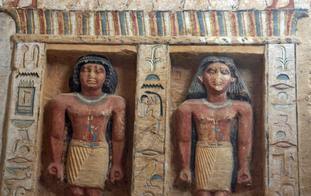 Mr Anani said the tomb contains scores of statues of different sizes and colours. In recent years, Egypt has heavily promoted new archaeological finds to international media and diplomats in the hope of attracting more visitors to the country. The vital tourism sector has suffered from the years of political turmoil since the 2011 uprising.